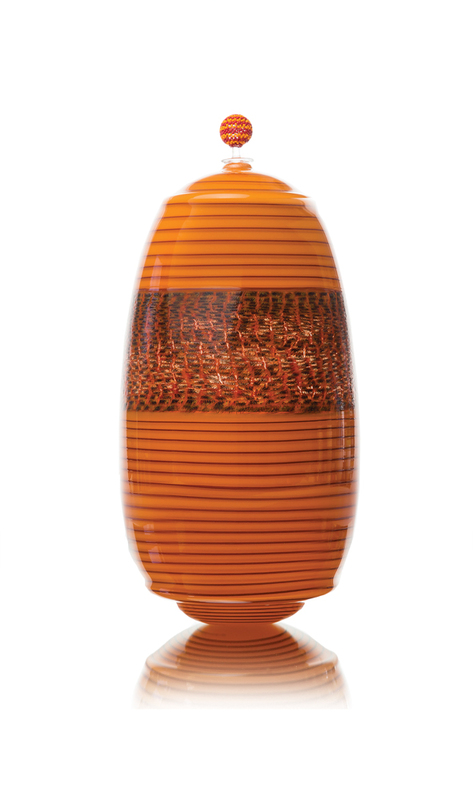 With singular passion and openness to influence, Corey Pemberton produces distinctive glass work. Published on Friday, March 29, 2019. This article appears in the February/March 2019 issue of American Craft Magazine. Pistachio Ukhamba, 2017, blown glass, glass seed beads, nylon thread, 12 x 9 in. dia. It was the right decision. Since graduating from VCU in 2012, the 28-year-old artist has done more than make a living in his chosen medium; he has developed a style at once personal and fluid, channeling both his own perspective and a range of influences. 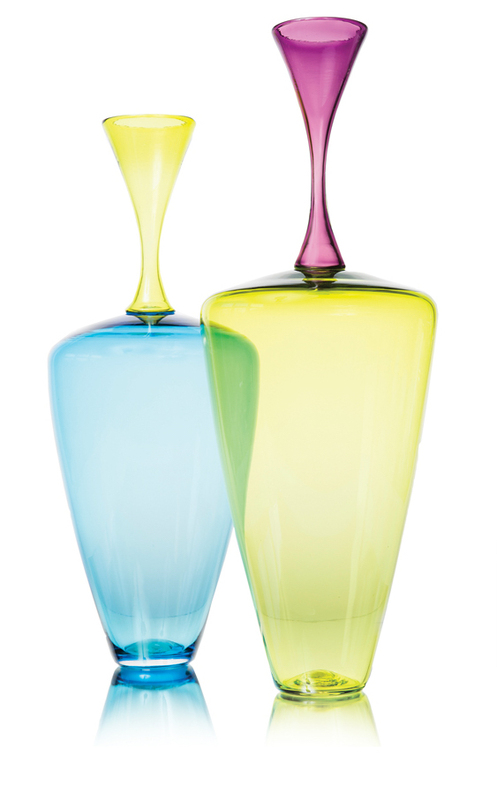 In form, his vases and bottles are refined but not rote, by turns rotund and sleek: “The less you touch [the glass] and the more you shape it with air, the better it looks” is a credo. He’s bold with color; his Grain Bowls (2016) feature swirls of burnt orange, his Pistachio Ukhamba (2017) bands of the namesake hue. 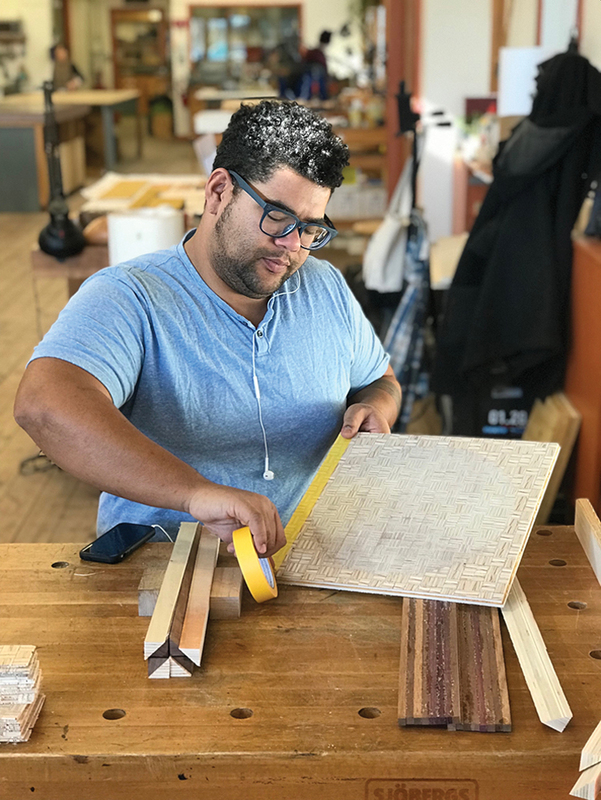 Corey Pemberton at Penland School of Crafts taping a parquetry wall hanging. Over the course of his two-year fellowship, Pemberton has experimented with wood, paper, and ceramics – always with an eye toward bringing his discoveries back to glass. Curry Ukhamba, 2017, blown glass, glass seed beads, nylon thread, 16 x 7 in. dia. Fluted Vases, 2016, blown glass; the vase on the right is 2 ft. tall. 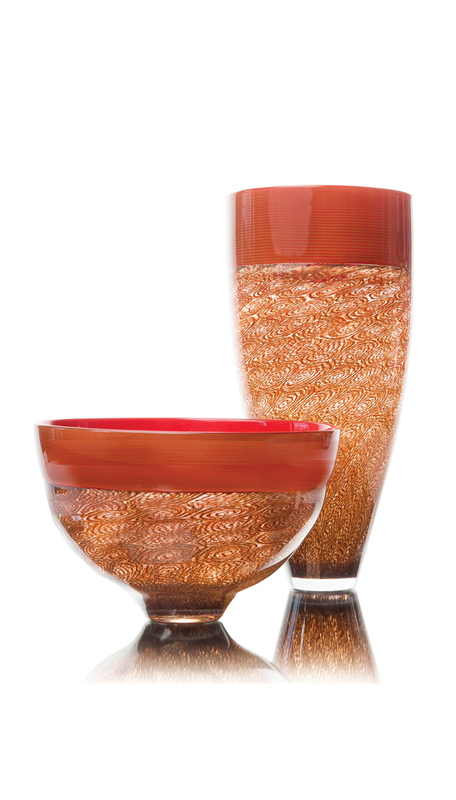 Grain Bowls, 2016, blown glass; the vessel on the right is 2 ft. tall. Pemberton claims wide-ranging influences, from Ellsworth Kelly to Zulu basketry. He also credits a seeming limitation – his red-green color-blindness – for his unique approach to color.